On June 9, 2018, President Xi Jinping met with Prime Minister Narendra Modi of India in Qingdao. Xi Jinping pointed out that more than one month ago, Mr. Prime Minister and I successfully held an informal meeting in Wuhan, reaching important consensus. Both the two countries and the international community spoke positively of this meeting. The positive atmosphere of caring for and supporting the development of China-India relations is taking shape. China is willing to, together with India, take the meeting in Wuhan as a new starting point to continuously enhance political mutual trust and comprehensively carry out mutually beneficial cooperation, so as to promote China-India relations for forward-looking development in a better, faster and steadier manner. Xi Jinping stressed that China and India have reaped quite a few early-harvest outcomes in implementing the consensus reached at the meeting in Wuhan. The two sides should make persistent efforts to speed up the implementation, maintain strategic communication, expand economic and trade cooperation, promote people-to-people and cultural exchanges and enhance coordination and cooperation on international and regional affairs. Xi Jinping welcomed India's attendance at the meeting of the Council of Heads of State as a full member of the Shanghai Cooperation Organization (SCO) for the first time. The Chinese side stands ready to work with India and other member states to jointly carry forward the “Shanghai Spirit” and promote the sound and stable development of the SCO. Narendra Modi expressed that the informal meeting between President Xi Jinping and him in Wuhan not long ago was very successful and also very important, which has further firmed his confidence in developing India-China relations, and will certainly be a milestone in the history of the relations between the two countries. India-China cooperation is of great significance to world peace and prosperity. The Indian side is ready to promote bilateral relations for constant and forward-looking development on the basis of the informal meeting in Wuhan. As a new member, India stands ready to play an active role in the SCO, and supports China in successfully holding the Qingdao Summit. 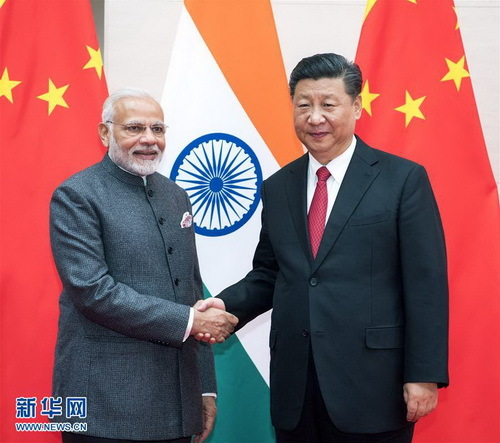 After the meeting, Xi Jinping and Narendra Modi jointly witnessed the signing of relevant bilateral cooperation documents. Ding Xuexiang, Yang Jiechi, Wang Yi and He Lifeng attended the meeting.